Give us some basic details about your situation and your house – Quick, Easy & Free! We’ll see if it matches our buying criteria. And we may ask you some follow up questions. You’ll get a fair written, all cash, no obligation offer. Close on your property and collect your check! Time frame: Once we’ve had a chance to chat and get additional information about you and your house, we are usually able to make you a fair all-cash offer within 48 hours. After you accept our offer, we can usually close as quickly as 7 days…But it could take from 7 to 28 days depending on the degree of difficulty and if there any complications. We will help you if you need to close on or before a specific day. 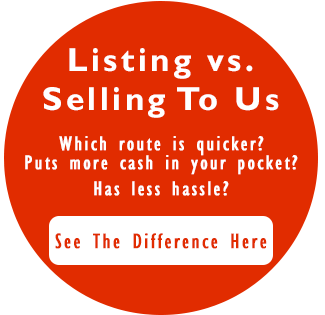 Wondering why your house won’t sell? Here at Ittenbach Capital, we buy houses all around Indianapolis, Indiana. We are actual house buyers. So when you call us you will be talking to someone who can buy your house for cash and build a solution that works for you. Since we pay with all cash, we are able to close quickly (or on the date you choose) because we do NOT have to wait on bank financing. Remember: You will NOT be charged any fees or commissions when you work with us because we are not agents. And we pay all the closing costs which means you don’t have to worry about coming out of pocket to sell your house fast. Call us today or fill out the form below to learn more about Our Simple And Proven 4 Step Process – Sell Your House Fast For Cash. Plus, you don’t have to worry about or pay for repairs, painting, or cleaning your house because we buy houses in As-Is condition. We have found that buying houses in As-Is condition takes a lot of stress off of people. Our crews will take care of all that stressful work after we buy it. Then you’ll never have to worry about that again. Learn about some of the areas we serve today!